USDJPY is only affected by the Trade Balance in Japan because the US is not releasing any economic data. Moreover yen is being supported by the Bank of Japan decision regarding the monetary policy. USDJPY has been moving with bearish bias since the previous high at 111.452. The support rests at 104.310 with resistance at 105.010 which both lines are below the monthly pivot point at 109.230. The EMA of 10 is moving below the EMA of 75 showing the current price fall. 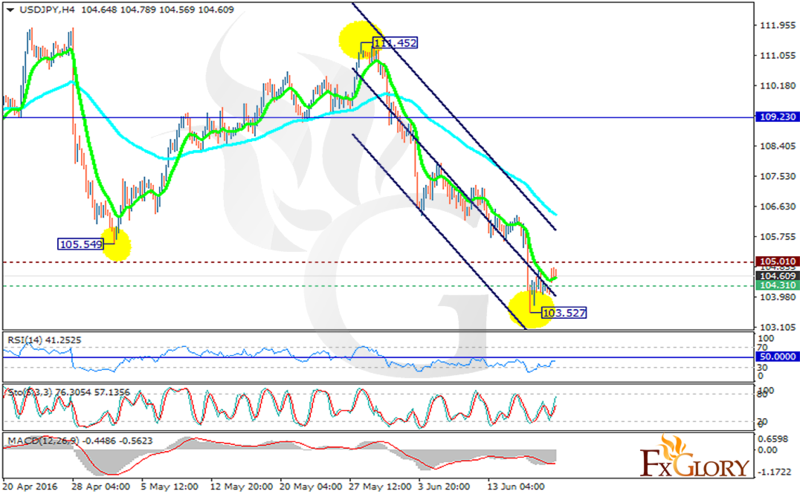 The RSI is getting close to the neutral area and the MACD indicator is in negative territory. However the Stochastic is showing upward momentum. The support level breakthrough will push the price downward within the descendant channel targeting 103.50.